American author, editor, and critic; born in Philadelphia 1838; died May 2, 1904. As a boy he displayed marked talent as a violinist, in spite of which he devoted himself more to literature. Of his works may be mentioned "Scintillations from the Prose Works of Heinrich Heine," containing translations of "Florentinische Nächte" and of numerous aptly chosen autobiographical excerpts from the poet's works; and translations of Auerbach's "Waldfried" (1873) and "Auf der Höhe" (1875). On his return from a trip to the Far East (1887) he published an account of his travels in a book entitled "Jottings of Travel in China and Japan." 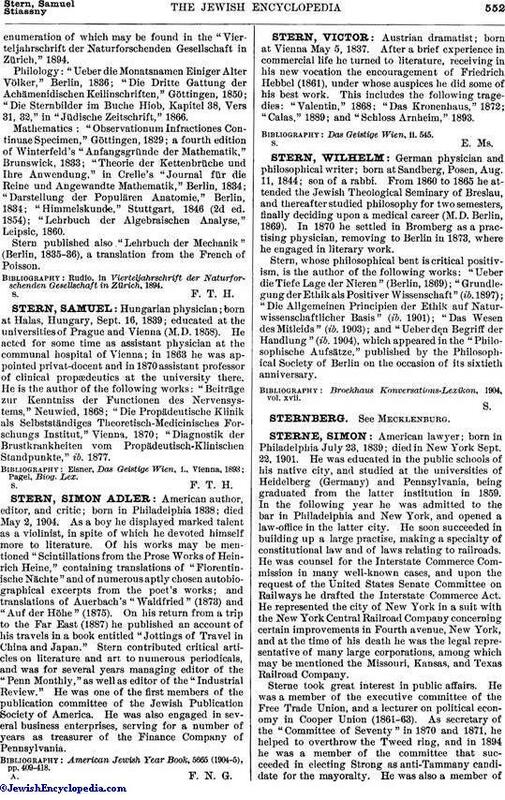 Stern contributed critical articles on literature and art to numerous periodicals, and was for several years managing editor of the "Penn Monthly," as well as editor of the "Industrial Review." He was one of the first members of the publication committee of the Jewish Publication Society of America. He was also engaged in several business enterprises, serving for a number of years as treasurer of the Finance Company of Pennsylvania. American Jewish Year Book, 5665 (1904-5), pp. 409-418.